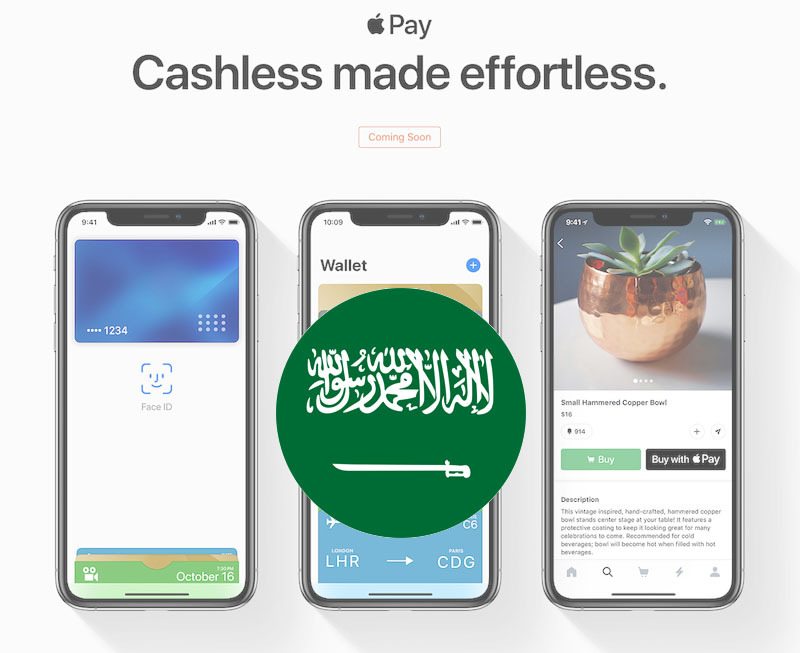 Apple today announced that Apple Pay is "coming soon" in Saudi Arabia, without providing a more specific timeframe. The Saudi Payments Network (MADA), a major payment system in Saudi Arabia, also confirmed that it will soon introduce support for Apple Pay. Saudi Arabia would become at least the 30th region where Apple Pay is officially available. Apple Pay is also set to launch in Germany later this year, as Apple CEO Tim Cook confirmed on the company's earnings call in late July. Apple Pay first launched in the United States in October 2014, and has since expanded to many other countries, such as the United Kingdom, Canada, Australia, China, Singapore, Switzerland, France, Japan, Spain, Italy, Sweden, Finland, Denmark, Russia, New Zealand, Brazil, Poland, Ireland, and Ukraine. Reading this web-site almost from the days of creating and this is the first time i've decided to write here. Please, there is no need in THE in front of Ukraine. Ukraine, not 'the' Ukraine. It's only been 27-odd years since Ukraine left the Soviet Union. Does Face ID work with burkas? Just FYI, AFAIK you mix up the Burka ('https://en.wikipedia.org/wiki/Burqa') with the Niqāb ('https://en.wikipedia.org/wiki/Niqāb'), the latter is common in S.A., the former one is worn in some parts of Pakistan and in Afganistan amongst a few others, the Niqāb (Mostly black colour) covers the face while the Burka covers everything, even the eyes, there's a mesh cloth in front of the eyes. I know it's worn in the North of Pakistan, been there. There are still lots of TouchId iPhones, for sale as well so I guess most women (Covered faces) prefer that one instead of the X iPhones. Isn't FaceTime still banned there? Small steps I guess. The ban was lifted a few months ago. In German, the Ukraine has an article. I've never been. How's NFC support at terminals there? Were terminals just recently upgraded? Everywhere I have been uses these terminals...I’d say this update will roll it out to pretty much every business in Riyadh.